Following up with prospects and customers is a staple of sales. Everyone knows they “should” do it. In fact, you could argue that CRM systems exist primarily to support following up, broadly speaking. Think about it this way. Contemporary CRMs define a “lead” as someone worth a follow-up attempt, to be converted into a “contact” (a person) at an “account” (a company) when that follow-up bears fruit – sometimes when a discovery conversation is scheduled or maybe when that conversation discovers there is an “opportunity.” Opportunities are worked through defined stages until they close as wins or losses. It all sounds very neat and orderly. Interest, followed by contact, followed by discovery, followed by opportunity, followed by closing. A nice, linear process. We call it a “funnel” to recognize inevitable attrition along the way. 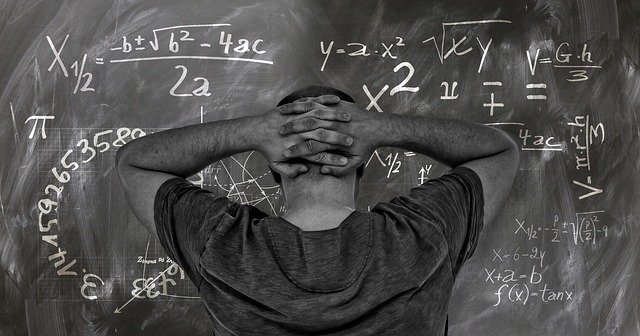 Then we do “funnel math” to figure out how many leads need to go in the top of the sales funnel to produce the desired flow of closed deals out of the bottom. The sales funnel metaphor tells us lots of important things. But, unfortunately, it paints a picture that leaves out the most common – and, therefore, the most important – outcome of any sales interaction. The flow of the funnel makes us pay attention to the positive flow: the conversations that end in yes! The shape of the funnel tells us that no is also heard along the way. But what about those other two sales conversation outcomes: “not me” and “not now”? Are they important to our funnel math? In terms of funnel math, however, a “not me” doesn’t really do anything. One “Ray Wrong” becomes one “Rae Right” – nice, but it creates no real change to how many leads must go in the top to make your sales goals. If the obviously positive “not me” doesn’t affect funnel math much, then it would seem “not now” would do even less. After all, if someone isn’t ready to do business with us now, shouldn’t we boot them out of our funnel and send them back to the marketing department to be nurtured until ready to engage in our sales process? You see, “not me” is treated like dark matter – that stuff that makes up 60 percent of all the mass in the universe. Dark matter bends space-time so galaxies spin way faster than they should, yet it is invisible to us and our instruments. In other words, dark matter dominates the shape and velocity of our “funnels” (the Milky Way and all those other galaxies) but doesn’t yield new stars or even a little light to brighten up our dark skies. Product replacement cycles tend to be long. When we buy a product (or a service to solve a problem) we usually aren’t looking to replace it for about three years. That means an intrinsically qualified buyer (our dream client) is only in the market for our category of product for one out of every 12 calendar quarters. That means a perfectly executed sales conversation with a perfectly qualified buyer will yield “not now” almost 92 percent of the time. That’s dominance! There is only one reliable way to find out if the timing is right for the prospective buyer to consider your product category: have a live conversation. Sure, there are vendors who claim they have dark matter detectors that can tell you when buyers are ripe and ready to make a purchase. But none of their techniques based on publicly available – and, therefore, competitively irrelevant – data can compete with a skillfully managed conversation. So, we have a 92 percent dominant sales factor – timing – that can only be reliably determined by a rather expensive measurement: a conversation. Our standard funnel treats this dominant set of potential opportunities as “disqualified” and sends them back to marketing for nurturing. In other words, they’re thrown away in the vain hope they will come back on their own when they are ready. But what if we could capture that 92 percent instead of throwing them aside? The effect on our funnel should be massive! This is especially true if we are capturing them, and our fiercest competitor is using the standard “send them to marketing for lead nurturing” program. It turns out that, by using one simple mechanism, we can do that: by systematically following up “not now” conversations with (wait for it…) conversations! These can certainly be interspersed with the usual email “drip campaign,” (by the way, who named this anyway? Is being dripped on really that great? ), but the key is the follow-up conversation itself. An email, no matter how full of compelling content, won’t give you the answer to the question of whether “now” has arrived. It’s usually easier to get prospects on the phone when making a follow-up call. 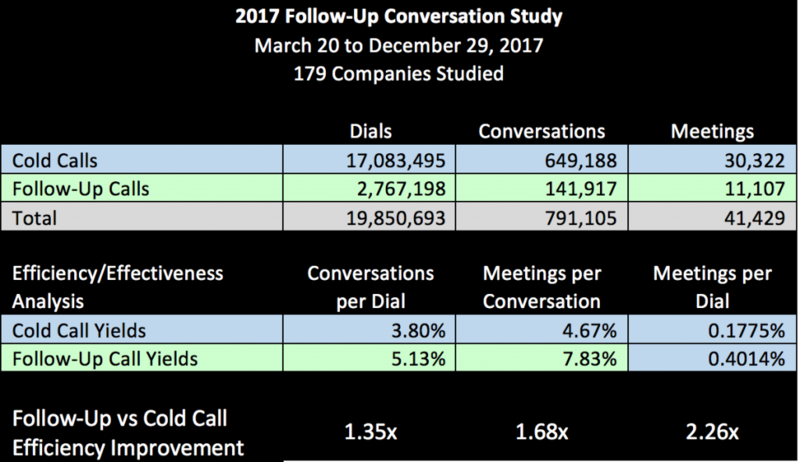 The “2017 Follow-Up Conversation Study,” which analyzed almost 20 million dials in 2017, found that follow-up dial attempts reach the right party 1.35 times as often as cold dial attempts. This is not because these people are psychic and know it’s their favorite salesperson calling. It’s because follow-up lists consist entirely of people who have answered the phone before. In other words, the first conversation (or cold call) yielded one additional piece of information: this person is more likely than average to answer phone calls. The same study found it is 1.68 times easier to set a meeting from a follow-up conversation than from a first conversation. The reasons for this are more subtle. First, if the timing is ever going to be better, it will be in the future – and, on a follow-up call, the future is now! Second, the conversation is easier to get started with rapport, because you can begin where you left off – especially if you wrote your future self a mini-script based on the previous conversation. Third, it is possible that humans are more likely to listen to someone whose voice they have heard before. The combined effect of harvesting all this “not now” dark matter is that follow-up conversations are 2.26 times more efficient than cold conversations end to end – from the dial attempt through setting the appointment. This is like having your team of 10 sales professionals magically turn into a happy band of 26 without spending a penny. To summarize, “not now” timing is the dominant problem to be solved in B2B sales. Like dark matter, it makes up the bulk of our sales conversation universe. But, unlike dark matter, it turns out there is a simple way to tame the bad timing problem: systematically follow “not now” conversations with appropriately timed future conversations. What’s even better: Follow-up conversations are cheaper and easier to get, more pleasant to have, and have much higher yield than first conversations! Use cold conversations to manufacture follow-up opportunities – and some meetings. Have follow-up conversations to set more meetings or at least to manufacture more follow-up opportunities. Problem solved. Must be time to go back to figuring out that dark matter thing. 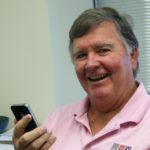 Hear Chris Beall speak at the Sales 3.0 Conference March 12-13 in San Francisco, where he will present “What Every Sales Leader Must Know about the Artificial Intelligence-enabled Salesperson” with Bruce Lewolt, CEO and Co-founder, BrainX and JoyisJoy.com. Chris Beall is CEO of ConnectAndSell. He has been participating in software start-ups as a founder or at a very early stage for most of the past 30 years. His focus has consistently been on creating and taking to market simple products that can be used successfully the first time they are touched, without taking a course or reading a manual. His belief is that the most powerful part of any software system is the human being we inappropriately call a “user,” and that the value key in software is to let the computer do what it does well (go fast without getting bored) in order to free up human potential. This entry was posted in Sales Strategy, Sales Success, Selling Skills and tagged prospecting, sales funnel. Bookmark the permalink.